The facts are pretty simple. An officer is patrolling downtown Fort Worth and pulls up to a car where there was a passed out (asleep?) girl in the passenger seat. How many times has that ever happened in Sundance Square? Here are the facts . . . The officer stopped the car but there was not a traffic violation and there was no illegal conduct to justify the stop. The officer thought she needed his help because of "alcohol poisoning". Really? Ultimately, she didn't need his help at all. 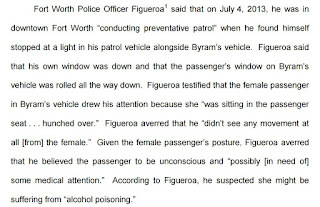 But once he stopped the vehicle, he "simultaneously" conducted a DWI investigation on the driver and arrested him. 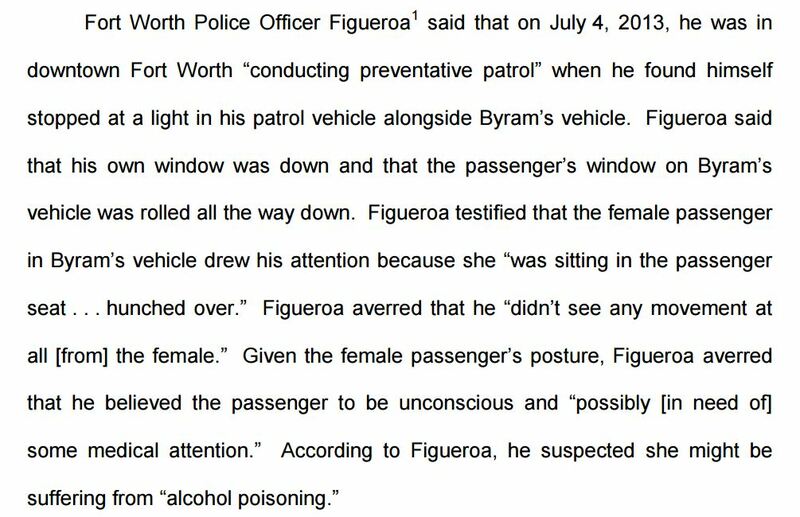 The Fort Worth Appeals Court correctly decided that the officer, uh, you can't stop a vehicle for that. So police should have the right to stop any vehicle where the passenger is asleep and the driver doesn't respond to an officer when the driver has absolutely no obligation to respond?